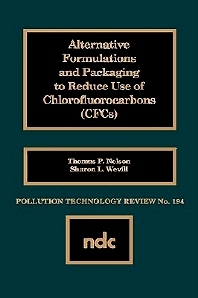 This book describes alternative formulations and packaging techniques for the reduction or elimination of chlorofluorocarbon (CFC) use as an aerosol propellant. Use of CFCs in specific categories of aerosols considered "nonessential" was banned by the U.S. in 1978. Recent renewed interest in further reducing worldwide production and consumption of CFCs, and other chemicals implicated in the depletion of the earth's stratospheric ozone layer, is responsible for this study, which covers currently exempted and excluded CFC aerosol applications and their alternatives.